3. 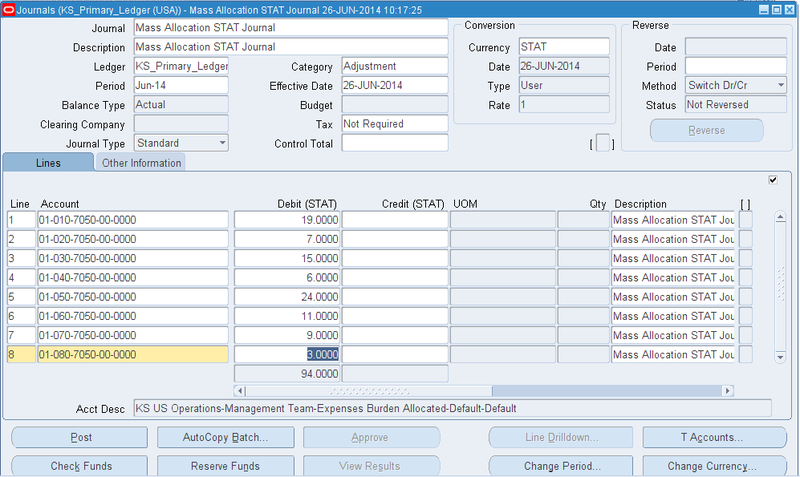 Define Mass Allocation Formula Batch and Journal. 5. 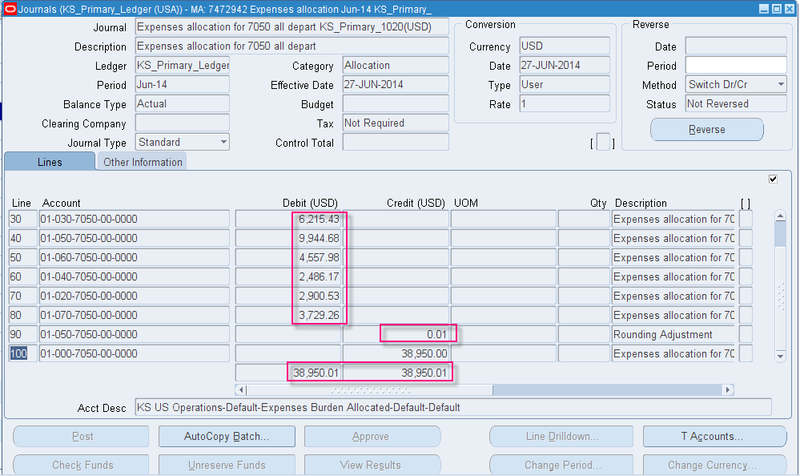 Generate the formula for specific accounting period. 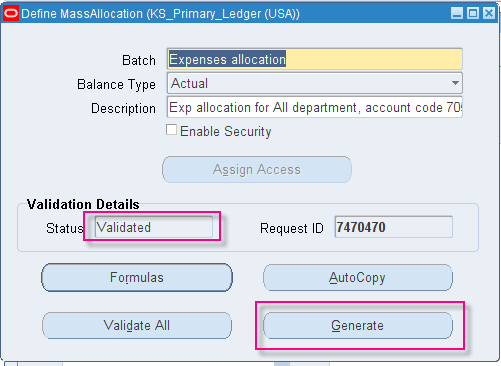 Let’s see how we can carry out the process of Mass Allocation in General Ledger. Let’s allocate the telephone bill expense of Rs. 38950 for the month of June incurred at Karachi branch on the number of employee each department has. 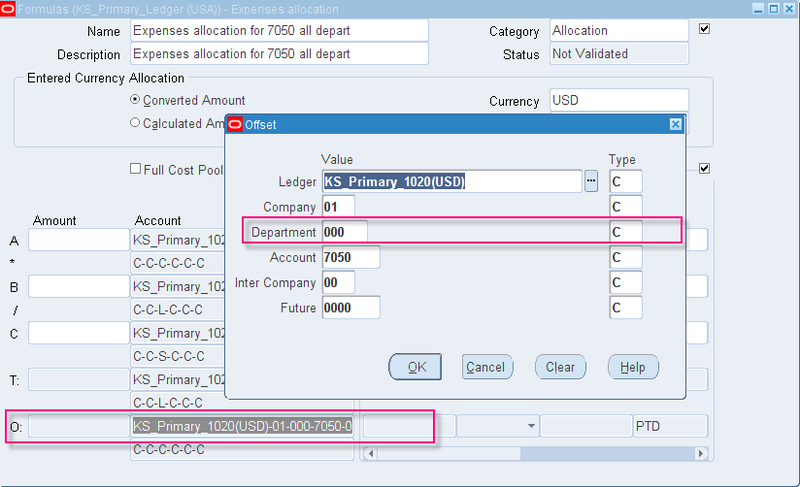 The allocation basis in this example is Head Count per Department. 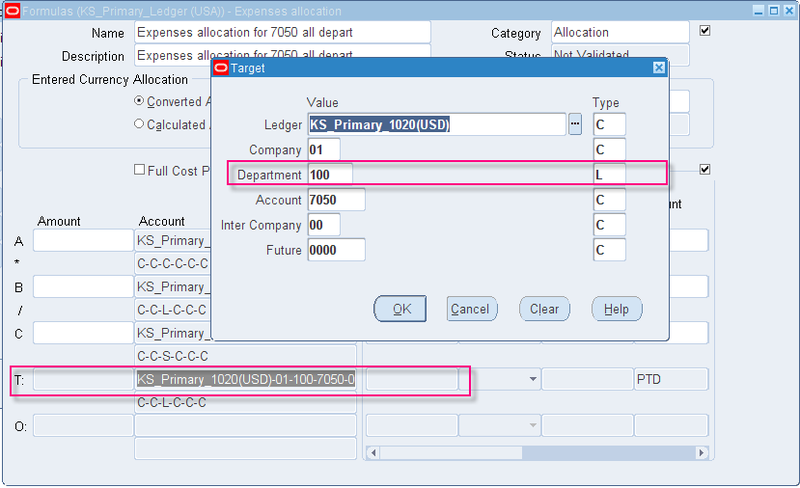 The account code for 01 and the natural Account for expense burden is 7050 and each department has 19, 7, 15,6,24,11,9 and 3 employees respectively. Now the MassAllocation procedure steps starts. This journal entry is equivalent to paying your telephone bill. Ideally this expense entry should be coming from Oracle Payables. 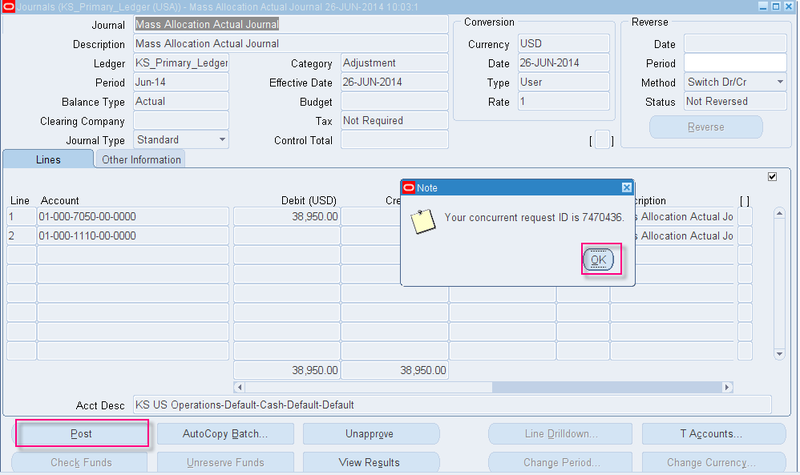 We are manually entering this actual journal so that we can created a Cost Pool “A” having an amount of Rs.38950. Now we will create the “B” and “C” or Usage Factor and “Total Usage”. Pass a STAT JV. STAT is short for Statisticaland it can be used by changing the currency from USD to STAT. The STAT journal doesn’t need to be balanced. But they do affect the account balances if we inquire on the currency type of TOTAL but let’s not get there, it is a different topic. Simply pass a STAT JV to create “B” and “C”. Remember the Period of the JV should be JUNE as the Standard JV. 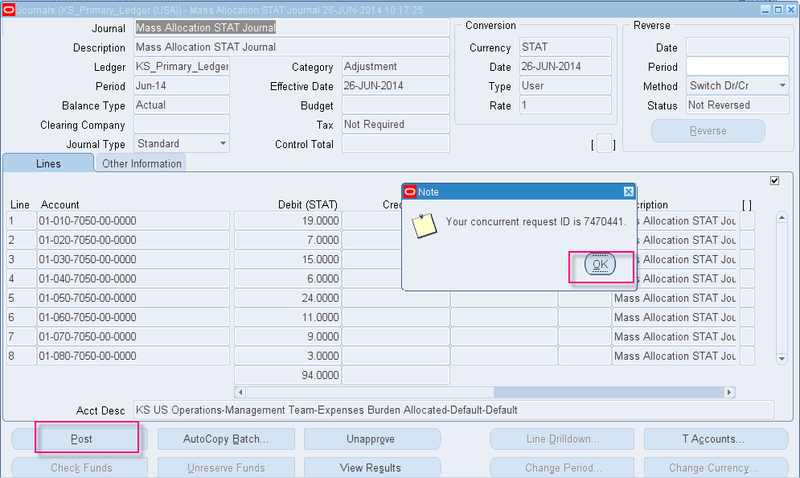 By passing or posting this STAT journal we are creating a basis for expense allocation. 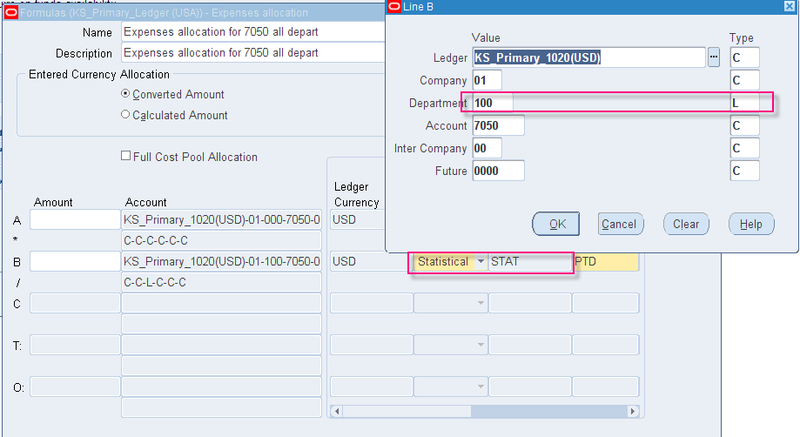 We can enable UOM on STAT journal by enabling the profile option JOURNAL:MIX STATISTICAL AND MONETARY to YES. Similarly so on and so forth. Now where are “B” and “C” in this journal? You can see 8 lines with changing Department codes, these four lines individually represent Usage Factor “B” which is 19,7,15,6,24, 11,9, & 3 and collectively they represent Total Usage “C” which is equal to 19+7+15+6+24+11+3=94. 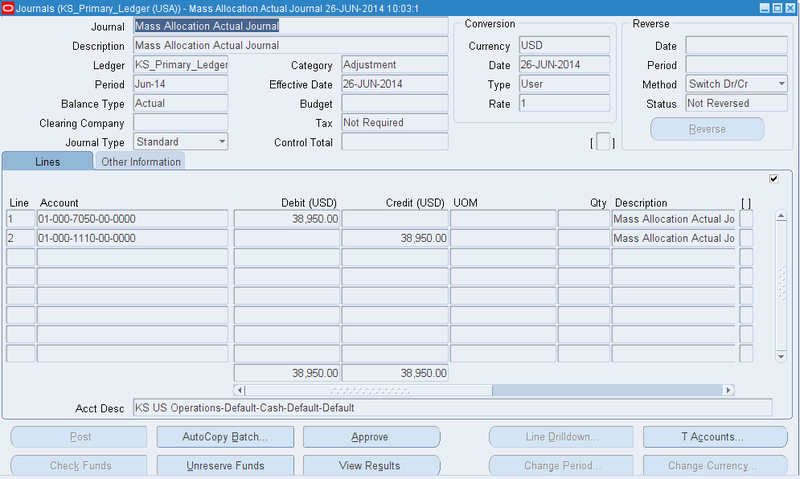 Create a MassAllocation Batch and then a Journal. When you open the formula entry form you will find the three constant of the Mass Allocation formula A, B, C and two other fields T and O. “T” stands for Target Account and “O” stands for Offset Account. I will explain these Accounts later. Let’s continue with the formula. 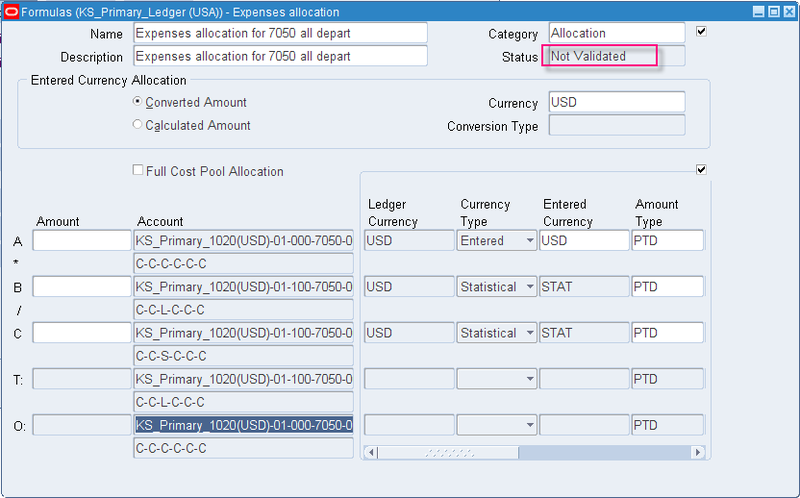 L: Looping – The segment needs to loop from first value to last value provided in STAT JV. 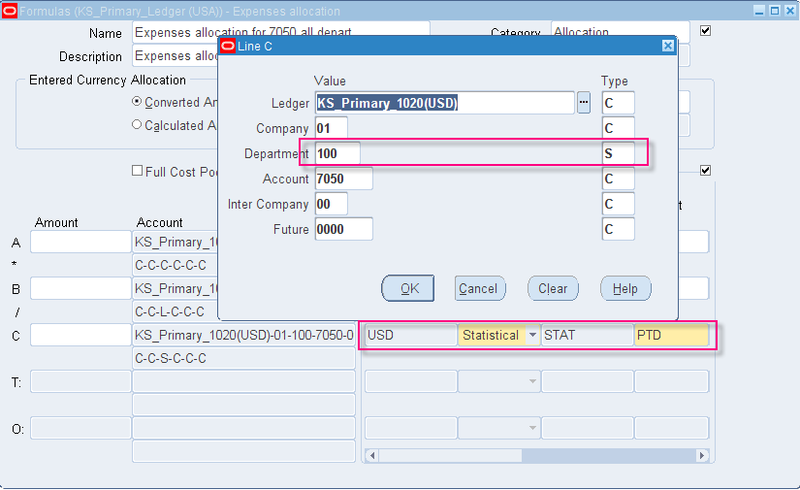 S: Summing – The segment needs to sum the value in provided in STAT JV. Generally the account code in “A” doesn’t not need any kind of looping or summing. So every segment should be given the value of C. The value this account has for the particular period should be picked as a constant. Keep the currency as Entered. 01-100-7050-00-0000. Note that I have given the department code as 100 which is parent of the departments we selected for allocation basis. Give every segment a Constant C but the segment of Department will be having the value as Looping L. Why? Because we need to pick the individual values of 19,7,15,6,24, 11, 9 and 3. REMEMBER: looping is only done on Parent Value of the Segment. In this example 100 is the Parent department which has the child departments 010, 020, 030,040,050,060,070 and 080. 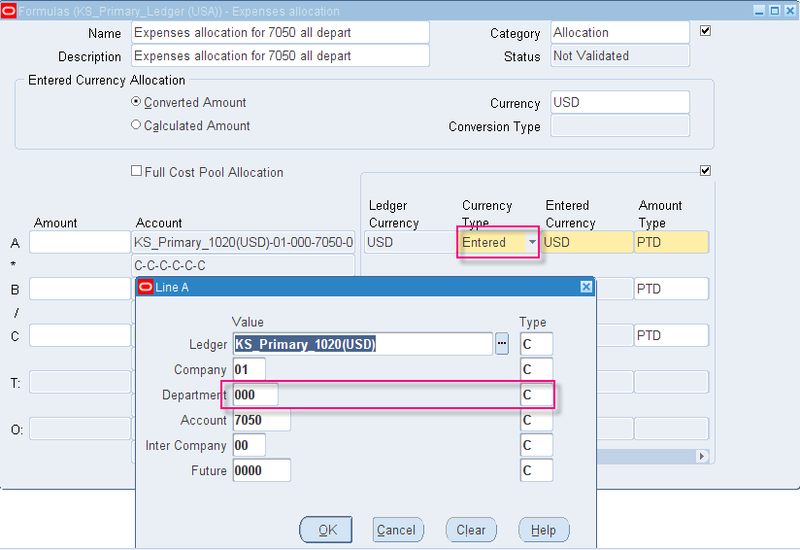 The system will automatically pick the allocation basis by matching the natural account and the looping segment. REMEMBER: The currency for “B” and “C” should be STAT. Now give the account code for the Total Usage “C”. The account code will remain the same as “B” with 100 as the department code. The only difference this time is that instead of Looping we will give the Department segment the value of Summing S. so that we can have the sum of head count which is 94. Let’s proceed further by entering the “O” or the Offset account. This account is same as the account we gave in “A”. This is the credit account. The account code combination given here will 01-000-7050-00-0000 with every segment as Constant. Now allocation formula has been completed. Generate the Mass allocation, click on submit. Got clear idea about allocation. GOOD JOB..HAVE A QUESTION;;let s assume that I have created 3 STAT journals for the same combinations..which one the system will grab while generating the allocation? 101.101.Finance.999.5436562.999.9999.999.999 Debit 60000 etc. and I want to allocate them to a Costed Location and Dept, should I make allocation journals for all line levels? Guys I have a requirement to formula with parent account of "Account segment" with looping. 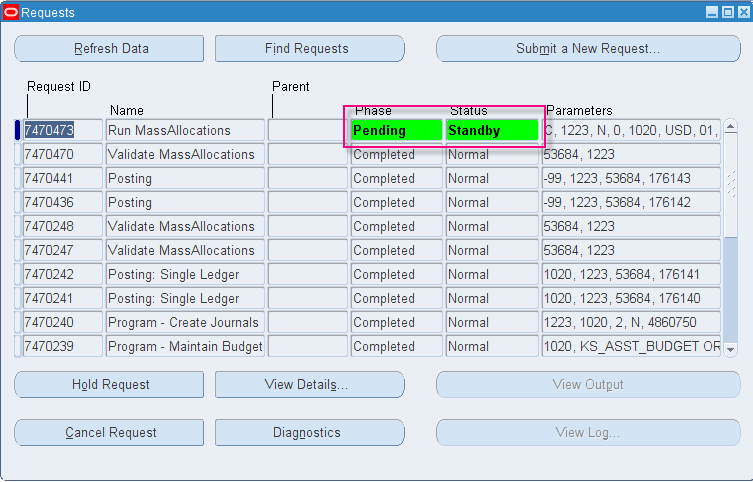 The user want to define single STAT journal with multiple "account segment values" with in a period and single formula with "account segment values" with looping and expecting that the system allocates the desired departments according to their concern accounts. When I use to define the above scenario, System is generating wrong Journal Voucher with wrong code combination and amount. Your assistance will be highly appreciable. Great Post. Please create such articles, definitely a big help for all Oracle learners. Such a very great & helpful.